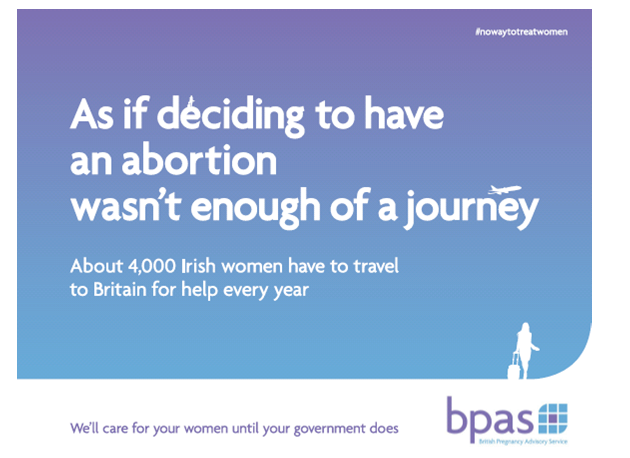 IN AN ADVERTISEMENT placed in Irish weekend newspapers, the British Pregnancy Advisory Service promised: ‘We’ll care for your women until your government does’. Historically, Irishwomen have travelled in their thousands to Britain for abortions, although there was also a culture of backstreet abortion in Ireland in the early part of the twentieth century. This ‘hidden industry’ made sensational headlines in 1956. Qualified midwife Mamie Cadden was sentenced to death by hanging for the death of Helen O’Reilly for whom she had performed an illegal abortion. Cadden had not been the only person offering such services. There had been a thriving backstreet abortion industry from the 1930s, although it was virtually wiped out by the 1940s as a result of a major clampdown. Cadden’s high-profile trial served as an uncomfortable reminder that, in a State where all forms of artificial contraception and abortion were illegal, Irish women who did not have the money to travel to England had few options. Abortions in Ireland were made a criminal offence under the Offences Against the Person Act, 1861, while the eighth amendment of the Constitution in 1983 copperfastened the right to life of the unborn. As the latter was being discussed, files released by the National Archives earlier this year under the 30-year rule reveal that there was an unease that such measures would not adequately tackle the reality of Ireland exporting the problem of abortion. Dr Michael Woods, the then-Fianna Fáil Minister for Health, told one gathering in 1982, ‘I believe that the process of amending our Constitution should mark the beginning of a sustained campaign to ensure that Irish women are not pressured to seek solutions to their problems in the abortion clinics of another country’. In the aftermath of the 1983 referendum, an editorial in the Anglo-Celt suggested that the debate might have ‘stirred the conscience of the nation’, making people more charitable and compassionate so that babies could be born outside marriage without stigma. It was an optimistic, but ultimately unrealised, hope. Almost one decade earlier, the Fine Gael-Labour coalition government (1973-77) had attempted to stem the flow of women travelling to Britain for abortions. The procedure had been legalised in the United Kingdom (with the exception of Northern Ireland) by the Abortion Act, 1967. The alternative offered by the coalition did not include comparable services in an Irish context. Rather, Richie Ryan, Minister for Finance, announced in his budget speech in 1973 a plan to provide (for the first time in the history of the State) for unmarried mothers, as they were then termed. Such financial support had been recommended in the report produced by the Commission on the Status of Women, and the measure represented progress in the area of family policy by broadening the definition of what constituted a ‘family’. But the measure was also framed in the context of the legalisation of abortion in Britain: by providing financial assistance to single mothers, it was hoped that they would continue with their pregnancy. Although there was a stigma attached to single parenthood, an unmarried mother was considered less problematic morally than a woman who was seen as abdicating motherhood through abortion. There was, however, a steady increase in the numbers travelling to England and Wales. As figures contained in the Green Paper on Abortion show, 578 abortions were carried out for Irish women in 1971, an average of one for every thousand women between the ages of 15 and 44. By 1979 that number had increased to 2,804 or an average of 4.1; by 1981 it was at 3,603, an average of 5.1; and by 1998 the figure had increased significantly to 5,892, averaging 6.9 for every thousand. Of course, these figures are not conclusive as they record only those women who provided their actual home addresses; many more gave an English address for the purposes of confidentiality. Ultimately, the issue of parenthood, single motherhood and abortion was all connected with the nature of Irish identity. Exporting the problem of abortion at least preserved the appearance of Ireland’s public morality. The state papers for 1981 and 1982 are now available to researchers. Contained within them are various concerns and warnings, some of which would come to pass. Peter Sutherland, Attorney General in Garret FitzGerald’s first government, expressed his doubts about the need for a Constitutional amendment, while Patrick Connolly, Charles Haughey’s first Attorney General, warned of ‘worrying ambiguities’. This was an issue repeatedly raised with Haughey while he was Taoiseach in 1982. He was advised that whatever wording was inserted into the Constitution, ‘must not damage the right to life of the living’. He was asked to consider if the right to life of the woman would be protected if she were a ‘mental or physical wreck’. Ultimately, though, it was acknowledged that this would be difficult to reconcile with the right to life of the unborn. It is a dilemma that continues to challenge governments who have considered the issue. With abortion services confined only to those extreme cases where the woman’s life is at immediate risk, Ireland continues to export its abortion problem as the thousands of women who travel to Britain repeat a well-established historical pattern.